I looked at my guide with a mixture of incredulity and panic as he steadily released tension on the rope. I was standing at the edge of a several-hundred-foot chasm of ice in the middle of a glacier. Behind me a waterfall roared, and when I craned my neck downwards to see where the water was falling I saw nothing — just a dark abyss. I was here, precariously positioned atop this icy ledge, to learn about the realities of climate change. And as I looked down, contemplating the icy grave below me, I realized that maybe this feeling of fear was what I had come looking for. I had come to Alaska to shoot a documentary on climate change. I wanted to step away from the data and statistics that dominate climate change rhetoric, to forget the graphs and turn off the TV. For two months, I unplugged from the stream of social media cries for climate action, as well as the dismissive rebuttals from opponents, which all seems so disconnected from the real thing. In Alaska, climate change is not an unknown, or a could be. Here, the effects are already real, already physical. They are not simply predictions and hypotheses but a presence on the landscape. Far away from the talking heads, I wanted to see what climate change is. 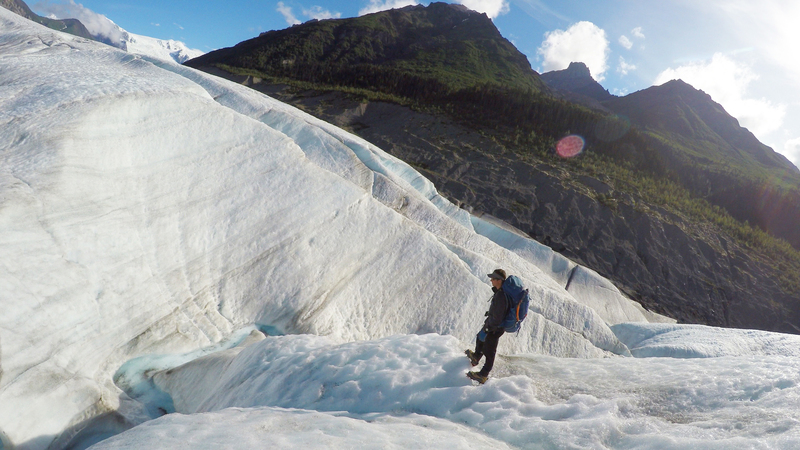 Alaska sets the standard for heart-stopping adventure. Its terrain, wildlife and weather can be dangerous, even merciless, but also stunning and generous in their natural splendor. There is very little to see in Alaska that doesn’t require at least some level of adventure, or some fear to be faced. Just 300 miles from Alaska’s most famous protected area, Denali National Park, sits Wrangell-St. Elias National Park. Over twice as large, and in fact the largest National Park in the United States, Wrangell-St. Elias dwarfs Denali in size, but attracts just one fifth of the visitors. With its four mountain ranges, thousands of glaciers and active volcano, I was surprised to find that Wrangell-St. Elias isn’t a more popular destination. That was until I learned about the gauntlet that travelers must conquer to even gain access to the park. Wrangell-St. Elias offers only two entrance roads to its 13.2 million acre expanse. One of these roads, the McCarthy Road, has such a bad reputation that most rental agencies forbid customers from driving their vehicles on it. Sixty miles of washboard gravel, potholes and washed-out shoulders make for an extremely slow and uncomfortable drive. After leaving pieces of my rental scattered along the McCarthy Road, I arrived at a footbridge where I was forced to abandon the car and hoof it into the town of McCarthy. Along the way I walked slowly, fully taking in Wrangell-St. Elias for the first time. The arduous journey was already well worth the trouble – I knew I had arrived somewhere special. Wrangell-St. Elias is not to be trifled with. Most of the park is designated as wild land, and hikers must watch their step and avoid disturbing or attracting bears and moose. Emergency responders are limited in their ability to respond to emergencies, and in many situations aerial search-and-rescue is the only way out of trouble. 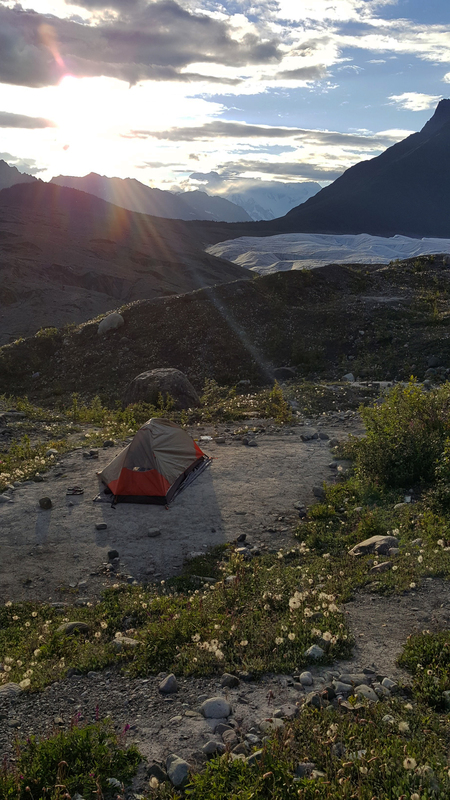 My tent overlooking the Root Glacier and St. Elias Mountain Range. The sun set at about midnight and rose at 4AM, merging dusk and dawn and painting the night sky a light pink. There are real dangers throughout the vast wilderness of Wrangell-St. Elias, but there is also untouched beauty. Pristine glaciers, rivers and waterfalls. Caves of ice and glacial canyons. During my time in the Wrangell-St. Elias National Park, I drank from a glacier. I climbed up and rappelled down walls of ice. My guide and I slept on the edge of two glaciers, beneath a massive sky, surrounded by mountains, without another soul for miles. I rock-skied down hills of glacial moraine, and trekked through moraine valleys that resembled a rocky Sahara Desert. 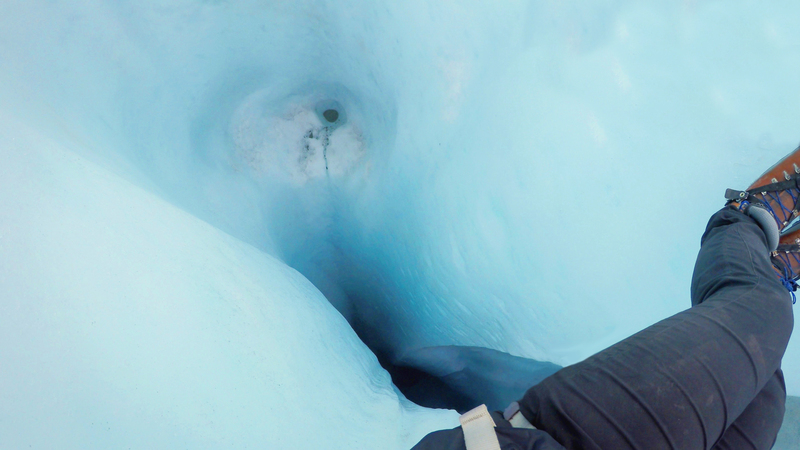 I explored a bright-blue, crystal clear ice cave. Cody and I stand on the Root glacier, aided by the crampons strapped on our feet which allow us to perch on icy cliffs and climb steep hills. But, indomitable and beautiful as it may be, the park is vulnerable to climate change. “Before you attribute all of that to climate change, though, you have to account for the tidewater glacier cycle.” Tidewater glaciers go through centuries-long periods of advance and retreat — behavior that is not necessarily connected to current climate change caused by greenhouse gas warming. Without taking these cyclical patterns into account, observers can grossly overestimate the impacts of climate change on Alaska’s glaciers. This was the kind of truth I needed in order to look at climate change in a realistic way. The ease of misrepresenting such crucial information was eye-opening. As a filmmaker, it is my responsibility to present accurate information. But on a larger scale, as someone concerned about climate change, I believe it is imperative to communicate accurately and truthfully. Not doing so opens the door to valid criticism or discredit, and gives opponents evidence to lay the foundations for counter-arguments that delay meaningful climate action. 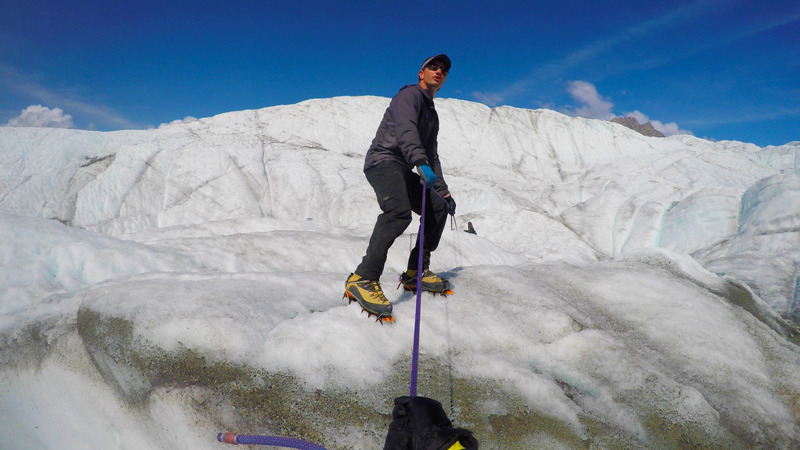 Beyond the glaciers, the effects of climate change are seen everywhere. On my drive to the town of McCarthy I saw thousands of standing dead spruce trees that had been killed off by a bark-bug beetle infestation. The forests of Wrangell-St. Elias stand exposed and defenseless against more frequent and destructive insect infestations, and an elongated and intensified fire season as a result of warmer seasons. 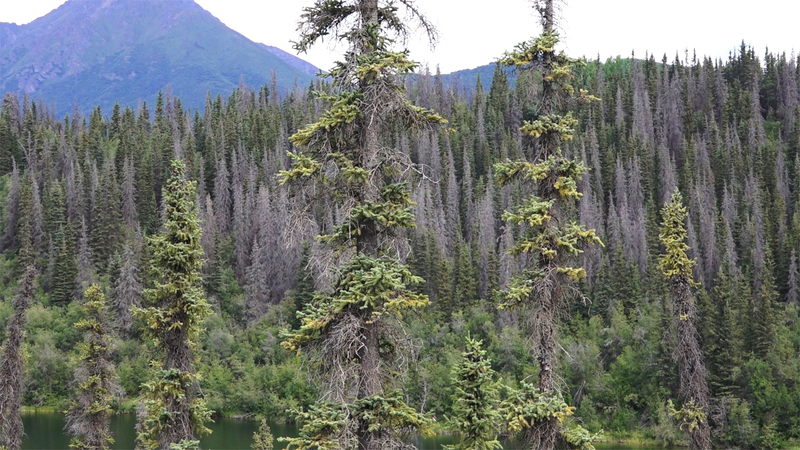 A glimpse at the devastating die-off of black spruce during a bark bug beetle outbreak. It’s important to remember that even here in remote Alaska, the threat of climate change is not just about melting glaciers and dying trees, though. Over the last few decades, incremental changes in temperature and precipitation have been almost imperceptible, or have at least only been an inconvenience to other parts of the world. But these changes indicate future warming patterns and changes in climate that will be more severe than what we see and feel today. To people living in the heart of Alaska, though, climate change is not a theory or a political platform, it is an everyday fact of life. In 2009, McCarthy implemented an aerial fire evacuation plan after a lightning strike ignited a forest fire that eventually burned more than 50,000 acres. The blaze almost reached McCarthy before firefighters were able to stop its advance. Without only one way out, this near tragedy revealed how easy it would be for the entire town to be trapped by a blockage on the McCarthy Road. The locals I spoke with in Wrangell-St. Elias and throughout the rest of the state responded to my questions about climate change with dynamism and resilience, despite the challenges that lay ahead. In the face of climate change I did not sense feelings of despair or controversy. Instead, I found rational assessments of the situation and realistic response strategies to specific problems. In addition to the putting together of the aerial evacuation plan, people in Wrangell-St. Elias have made arrangements with one another to cut down dead spruce trees and use the wood for biofuel. On the Kenai Peninsula, residents are importing Lodgepole Pine from Yukon to replace Spruce. Villages along the coasts are voting to relocate to safer locations, away from rising sea levels and coastal erosion. Near Fairbanks, homebuyers are getting their land checked for permafrost. Near Anchorage, energy and utility companies are figuring out how to tap into the enormous hydropower resource of Cook Inlet. Overall, Alaskans expressed far less concern over when, how, and why climate change is happening. To them, it was already here and it was the response that mattered. Distanced from this place, it’s easy to miss the raw emotions it inspires, the kind of emotions that countless books, new articles, graphs, and statistics can’t convey. In Wrangell-St. Elias I reconnected with nature. My mind and soul, tired and worn down by the caustic debates and ominous forecasts, were soothed by the silence of the wilderness. I left feeling refreshed, and reminded of the reasons I chose to pursue a career as an environmental filmmaker in the first place. In the park I experienced true fear. When I descended into the glacial chasm, I could hear my heartbeat in my ears, overpowering the roar of the waterfall. My view from inside the chasm; it was so deep that I was not able to see the bottom, which would have revealed an underground river that passed through the glacier. Feeling this terror reminded me of what it means to be human and to be vulnerable. Just hearing about natural disasters on the news, or reading climate change predictions in journals, it’s easy to forget what fear feels like. Wrangell-St. Elias reminded of why I fear climate change and the future it can bring, but it also gave me a renewed appreciation for the fears that others may have. It’s not just about academics. It’s about the loss of jobs, homes and a sense of security in place that people love. Christina Stone is a second-year Masters of Environmental Management student at the Yale School of Forestry & Environmental Studies. Her academic and professional specialty is communication, and is focusing her graduate work on scientific communication, particularly regarding climate change. Christina is also a writer and filmmaker and has over ten years’ experience working in communication, languages and training, including nine years in linguistics and military intelligence.